HyperMiling was selected the 2008 word of the year by New Oxford American Dictionary. Making jest I wrote about HyperPUE. But then I found Hyper-Green, Microsoft’s effort with virtualization. Microsoft has donated $20,000 to TechSoup - a nonprofit organization dedicated to refurbishing computers for use by underprivileged communities. This donation will help meet technology needs and reduce e-waste. You can support the movement for cleaner, more accessible technologies by donating to TechSoup as well. 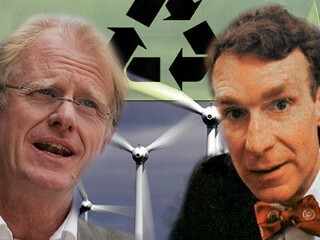 I wonder if HyperGreen will be a new term as well for the fanatical green efforts and to the extremes of Ed Begley, and Bill Nye the science guy. Eco-Friendly Competition: Who Can Go Greener? In Hollywood, where the streets are supposedly paved with gold, actor Ed Begley is all about green. His passion about energy use and the environment serves as the plotline for his new reality show, "Living With Ed," videotaped at his California home. But something is happening in his little corner of the Hollywood Hills, and Begley is feeling the heat. And it's not from his thermostat.